We include in this glossary definitions for a number of the basic terms and words used in the lighting community. For further information and formal definitions please see discussions in standard dictionaries, encyclopedias, the IES Lighting Handbook, and other lighting industry books. Note that some of these definitions are quite subjective, and are offered here as guidance only. Adaptive Controls: Devices such as motion sensors, timers and dimmers used in concert with outdoor lighting equipment to vary the intensity or duration of operation of lighting. Color Rendering Index (CRI) A measure of the accuracy with which a light source of a particular CCT renders different colors in comparison to a reference light source with the same CCT. A high CRI provides better illumination with the same or lower lighting levels. It is important not to mix lamps with different CCTs and CRIs. Specify both the CCT and CRI when purchasing lamps. Cones and rods: Groups of light-sensitive cells in the retinas of animal eyes. Cones dominate the response when the luminance level is high, and provide color perception. Rods dominate at low luminance levels, but give no significant color perception. Correlated Color Temperature (CCT): A measure in degrees Kelvin (°K) of light’s warmness or coolness. Lamps with a CCT of less than 3,200 °K are pinkish and considered warm. Lamps with a CCT greater than 4,000 °K are bluish–white and considered cool. Diffuser: A device used to distribute light from a source. Dimmer: Dimmers can reduce the input power requirements and the rated lumen output levels of in- candescent and fluorescent lights. Fluorescent lights need special dimming ballasts. Dimming incandescent lights reduces their efficiency. Efficacy The ratio of light output to its consumption of power, measured in lumens per watt (lm/W), or the ability of a lighting system to produce the desired result. Fixture Lumens A light fixture’s light output after processing of emitted light by optics in that fixture. Fixture Watts: The total power consumed by a fixture. This includes the power consumed by the lamp(s) and ballast(s). Infrared radiation: Electromagnetic radiation with longer wavelengths than those of visible light, extending from the nominal red edge of the visible spectrum at 700 nanometers to 1 mm. 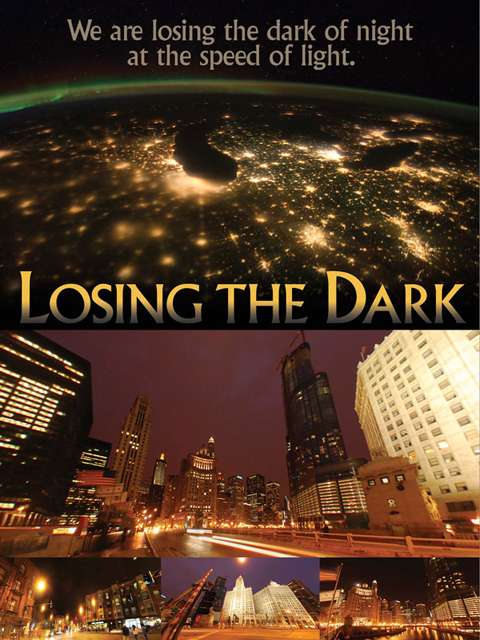 International Dark-Sky Association (IDA, Inc.): A non-profit organization whose goals are to build awareness of the value of dark skies, and of the need for quality outdoor lighting. Lamp Life: The average life span for a specific type of lamp. Half of lamps will perform longer than the average; the others will fail before the average. Light Quality: A measurement of a person’s comfort and perception based on the lighting. Light Spill: Unwanted spillage of light onto adjacent areas and may affect sensitive receptors particularly residential properties and ecological sites. Lighting Controls: Devices used for either turning lights on and off or for dimming. Photocells Sensors that turn lights on and off in response to natural light levels. Some advanced mode can slowly dim or increase the lighting. See also: Adaptive Controls. Lumen: Unit of luminous flux; the flux emitted within a unit solid angle by a point source with a uniform luminous intensity of one candela. Luminaire: A complete lighting unit that usually includes the fixture, ballasts, and lamps. Luminaire Efficiency: The ratio of the light emitted by the luminaire compared to the light emitted by the enclosed lamps. Luminance: At a point and in a given direction, the luminous intensity in the given direction produced by an element of the surface surrounding the point divided by the area of the projection of the element on a plane perpendicular to the given direction. Units: candelas per unit area. Mercury lamp: An HID lamp where the light is produced by radiation from mercury vapor. Passive Infrared: A lighting control system that uses infrared beams to sense motion. When beams of infrared light are interrupted by movement, the sensor turns on the lighting system. If no movement is sensed after a predetermined period, the system turns the lights off. Ultrasonic: A lighting control system using high–frequency sound waves pulsed through a space to detect movement by depth perception. When the frequency of the sound waves change, the sensor turns on the lighting system. After a predetermined time with no movement, the system turns the lights off. Optic: The components of a luminaire such as reflectors, refractors, protectors which make up the light emitting section. Photocell: An electronic device that changes the light output of a luminaire dynamically in response to the ambient light level around the luminaire. Reflector: An optic that achieves control of light by means of reflection (using mirrors). Refractor:An optic that achieves control of light by means of refraction (using lenses). Skyglow: Diffuse, scattered sky light attributable to scattered light from sources on the ground. Source Intensity: This applies to each source in the potentially obtrusive direction, outside of the area being lit. Task Lighting: Task lighting is used to provide direct light for specific activities without illuminating the entire area. Ultraviolet light: Electromagnetic radiation with wavelengths from 400 nm to 100 nm, shorter than that of visible light but longer than X-rays. Wallpack: A luminaire, typically affixed to the side of a structure, used for area lighting.